My self-imposed deadlines are on Mondays and Fridays. However, Friday was an MNPS School Board retreat. 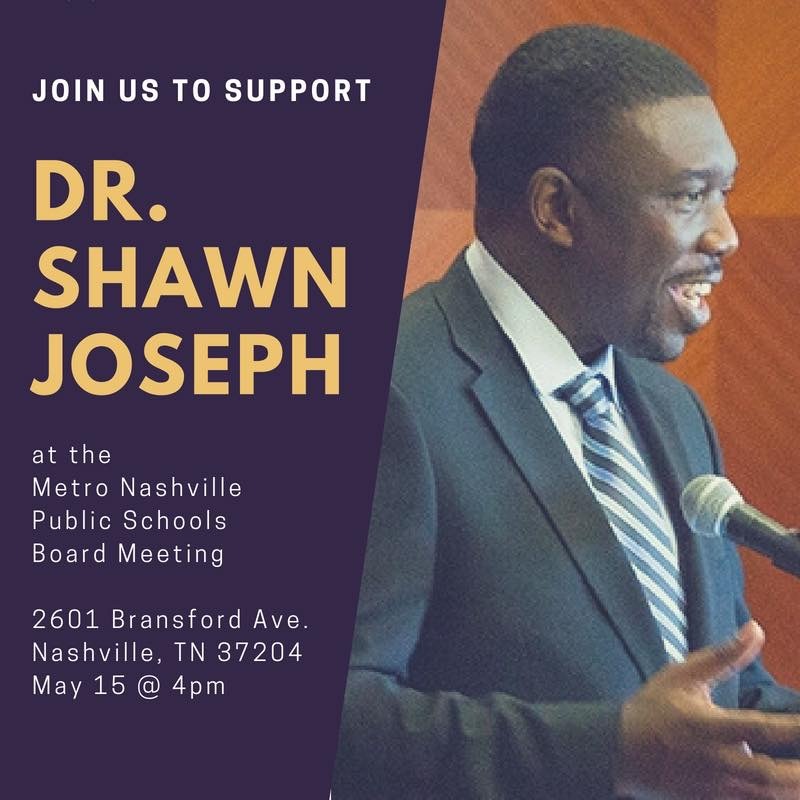 Since the agenda was focusing on next years budget and might possibly contain conversation about Superintendent Shawn Joseph’s future with the district, I thought I should attend. Therefore, today’s update is coming to you on Saturday morning instead of Friday afternoon. There is a lot to get to, and unfortunately, I won’t be able to touch on today’s events until Monday. One thing that can’t go unreported until then though is the board’s discussion, and ultimate commitment, regarding raises for teachers at the retreat. Employee compensation dominated the morning’s conversation on the budget, with all board members committed to increasing the proposed raises and including step increases for district emplotyees. Board members Anna Shepherd, Jill Speering, Fran Bush, and Amy Frogge were strong advocates for a 10% increase, while fellow board members Christiane Buggs, Rachael Anne Elrod, and Gini Pupo-Walker felt more comfortable with asking for a 6% plus step increase. Board Chair Gentry never voiced her preference and Will Pinkston was absent for the conversation. It should be noted that via social media, Pinkston has suggested that teachers advocating for raises would be better served to focus their energies on serving his agenda. The reason that some board member’s balked at a higher raise was out of a desire to appear as a good partner with Metro Council and ensure at least some increase. A fair argument, but Anna Shepherd challenged fellow board members to demand the budget that MNPS needs and not the one we think will get. A sentiment that I strongly concur with. More on the retreat Monday. 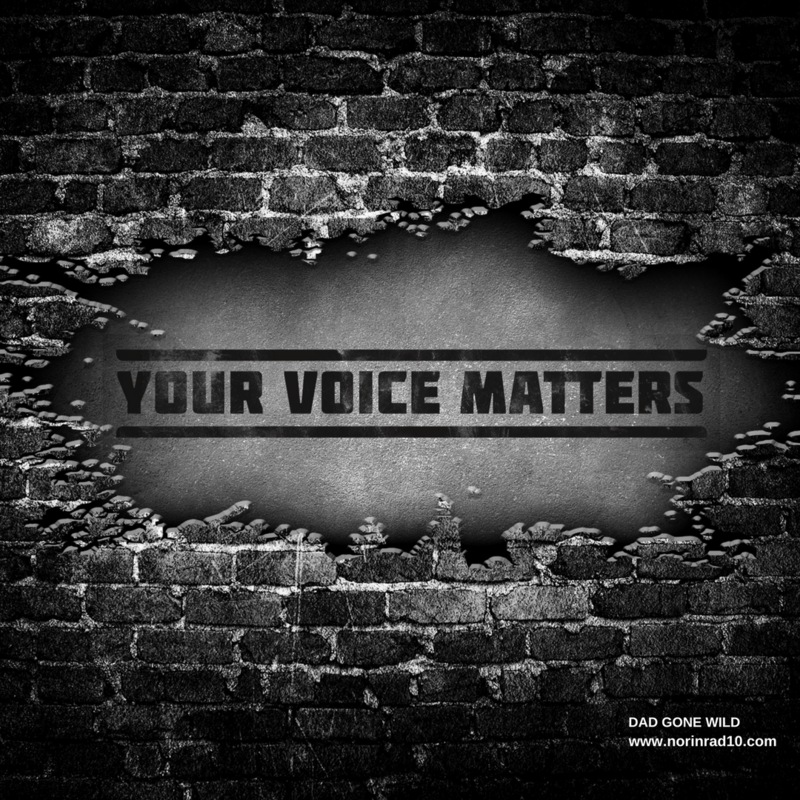 But I strongly encourage people to email the board and council members with your input. Before we dive into local news, let’s look at the dastardly deeds going on at the state level. There are currently two bills pending in the state that are causing quite a bit of concern for public education advocates. The first, and at first flush the least dastardly looking, is the establishment of a state charter school authorizer. Currently, charter schools apply to their local district, if denied authorization there, they can then appeal to the state board. The state board is empowered to overturn the local decision. Under the governor’s proposed legislation, there would be a new board appointed by the governor that would handle that decision instead of the state board. On the surface, not an unreasonable proposal. The bill has gone through some changes as it has proceeded through the legislative process. Many will be watching to see what the final outcome looks like. The bill passed out of the House Education Committee this week. The other bill is the particularly poison one. I’m talking about the voucher bill,l which we now refer to as the ESA bill. Savings accounts just sound better than vouchers. This bill establishes a saving account that any family of 4 that earns less than $93k a year can take advantage of if they live in a district with a school on the priority list. In other words, they are talking about the Weber family. Each account would be worth approximately $7300 a year and could be used by families for any educationally related expenses. Don’t think my eyes aren’t dilating just thinking about the possibilities. I could head over to one of Nashville’s exclusive private schools and start negotiations. Sure $7300 is only approximately half of what I’d need, but if I can talk them into giving me a little more of a discount…maybe doable. No matter what, $7300 is a damn sight better than having to come up with 15k. But what about my zoned public school. Sure they’d get some cash to make up for the backpack of cash walking out the door, but then there are those other intangibles. They’d lose an involved family that volunteers for events and participates in fundraisers. They’d also lose two high performing kids that impact the test scores that dictate how the school is rated. My kids also don’t get suspended and they show up every day, so they are helping on multiple measures. One of those hidden bits of knowledge is how few kids it takes to impact a school’s overall test scores. Factor out a few students and the narrative can change drastically. Just my kids leaving ain’t going to have that large an impact, but let’s say along with my family, 8 other families leave. That’s going to leave a mark. And next year when parents are evaluating their choices and things look like they are trending in the wrong direction, some may become concerned and pull their children. Eventually, you get to the point of a self-fulfilling prophecy and a school can take on the appearance of a failing institution.. When Governor Lee talks about pride in our school system, take it with a grain of salt. For legislators. when those SCORE lobbyists come knocking at your door – and they will because Lee has enlisted them – ask them why they tout Tennessee’s educational improvement over the past several years while trying to dismantle said system. Who invests in new tires for a car when they are taking out the engine and selling it at the salvage lot? The same principle applies here. I’m not a fan of assigning intent to people, because only they know their true motivation, but let’s be honest here, this isn’t about helping poor kids or giving families choice. It’s about setting up schools in urban areas for failure and making radical changes to a public good. It ain’t hyperbole when I say that if you treat this as anything less than a declaration of war on public schools, you are fooling yourself. If you think I’m exaggerating, just look at the tactics Lee and his cronies – notice nobody objects when I refer to Lee’s pals as cronies, but lord forbid I call Joseph’s pals a posse – are employing to get these bills passed. Freshman Representatives have been told they basically have a blank check for their district as long as they vote the right way on these bills. That’s a lot of pressure put on someone just learning to navigate the corridors of power while trying to make a good impression at home. Why do you think Lee met with the women who accused Education Committee head David Byrd of sexual harassment? Was it out of a deep desire to uncover the truth? Or was it to publicly remind Byrd that he serves at the Governor’s discretion? Better vote right son, or kiss that chair good-bye. The Governor is playing hard-ball and as such he’s delivering some chin music meant to knock you in the dust before you get a chance to swing the bat. This is now officially the big leagues, and there is no room for advocates to bring anything less than their “A” game. 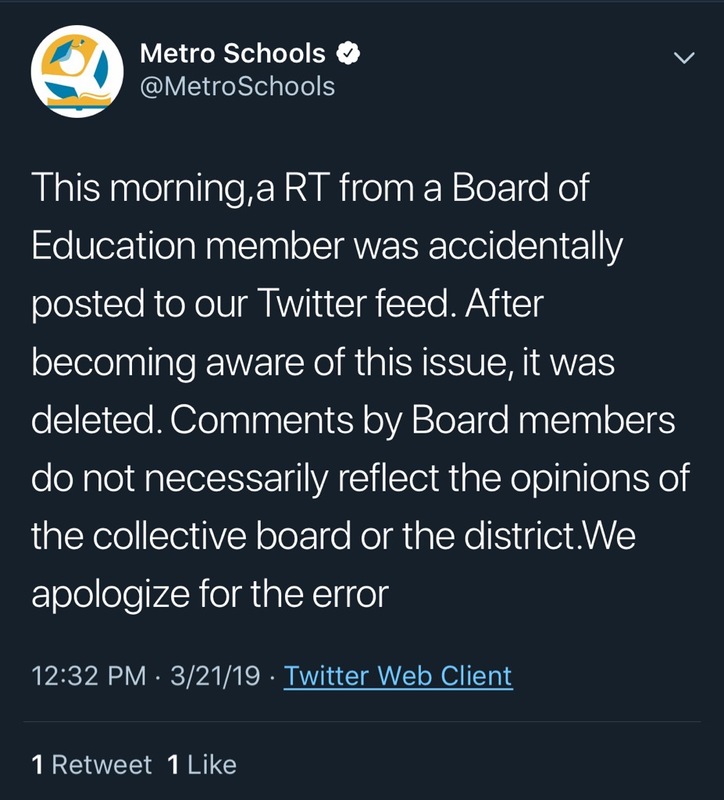 Thursday morning social media readers awoke to an alarming post from MNPS School Board member Will Pinkston. Pinkston was sounding the clarion call for what looked like just one more crisis in MNPS. Closer inspection revealed that this incident was just the opposite. In 2017 current principal Carrie Jones assumed the principal position at HG Hills Middle School. An overdue bill came across her desk that PTO president Janice Adrian claimed had been paid. It wasn’t and so Jones did some digging. It was quickly revealed that there was at minimum $14k unaccounted for. Jones followed the process and contacted her school auditor who verified her suspicions. This lead to facts being turned over to the state comptroller’s office. After a year and a half investigation, it was determined that in actuality, Adrian had misappropriated more than $31k and this week she was arrested. It’s a terrible story and rightfully has caused a great deal of concern for those involved with H.G. Hill MS, and MNPS as a whole. But in actuality, it should serve as a reassurance. Yes somebody allegedly took advantage of the system in a manner that benefited themselves at the expense of students and families. But H.G. Hill has leadership in place that recognized a problem, followed the process to confirm and address the problem, and then followed it through to resolution. Good policy does not ensure that nothing bad will ever transpire, but rather provide a means to catch and correct. Crimes are like mistakes, what you do with them after the occurrence is equally important as the actual incident itself. Hill leadership recognized some gaps in policy that allowed this incident to happen and have since enacted a new policy to close those gaps. Leadership has shown that in a case like this, in which nobody looks good, they are willing to do the right thing instead of worry about appearances. So what’s needed here is not a clarion call but rather a nod of approval over the handling of a horrible transgression. 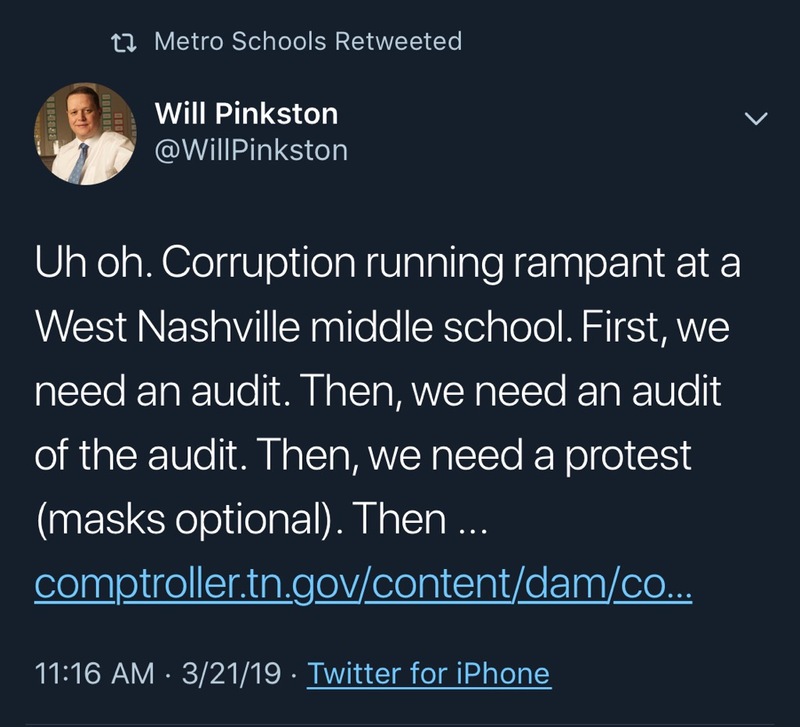 To complicate matters, the official Twitter account of MNPS retweeted Pinkston’s initial tweets. A move they would have to walk back. It may have been an innocent mistake, but seeing as Hill is in board member Amy Frogge’s district and she has been a frequent critic of the director, it feels politically motivated. As does Pinkston’s original tweet. Pinkston and Frogge have served together for nearly 8 years and in the past have been allies. Frogge has often spent her clout to lend credence to Pinkston strategies. However, they now find themselves at odds over the performance of the director. Rather than argue policy, Pinkston attacks personalities. In that light, the MNPS communication department has to do a better job of vetting the information it shares. MNPS held it’s annual State of Schools address midweek. This year the affair had a decidedly different feel. Holding the event during a weekday obstructs the attendance by the majority of MNPS stakeholders – teachers, students, families. That barrier may be the reason why there wasn’t a larger crowd in attendance. As it was, the auditorium at Stratford High was only half full. The format changed this year from previous years. In the past, the event was more of a traditional speech augmented by extensive video. This year, the traditional speech was abandoned in favor of what was intended to be perceived as more of a conversation. The videos remained. To facilitate the conversation, MNPS recruited Hillsboro HS senior Kennedy Musgrave. Musgrave is a formidable young lady. In addition to being a high performing student, she also created a support group for students of color enrolled in Hillsboro’s advanced academic program. Quite an accomplishment. Unfortunately, this was not a format that lent itself to permitting her talents to shine. Channel 5 News reporter Chris Conte summed it up best when he concluded a series of tweets with the proclamation that this was perhaps the most awkward event that he’d covered in his decade as a reporter. The conversation consisted mainly of Joseph’s preferred talking points and as such felt very canned and scripted. It was like watching a skit. Musgrave shared some of her experiences with bias at Hillsboro, which was very revealing, but pointed out that she had experienced bias from both white and black educators. 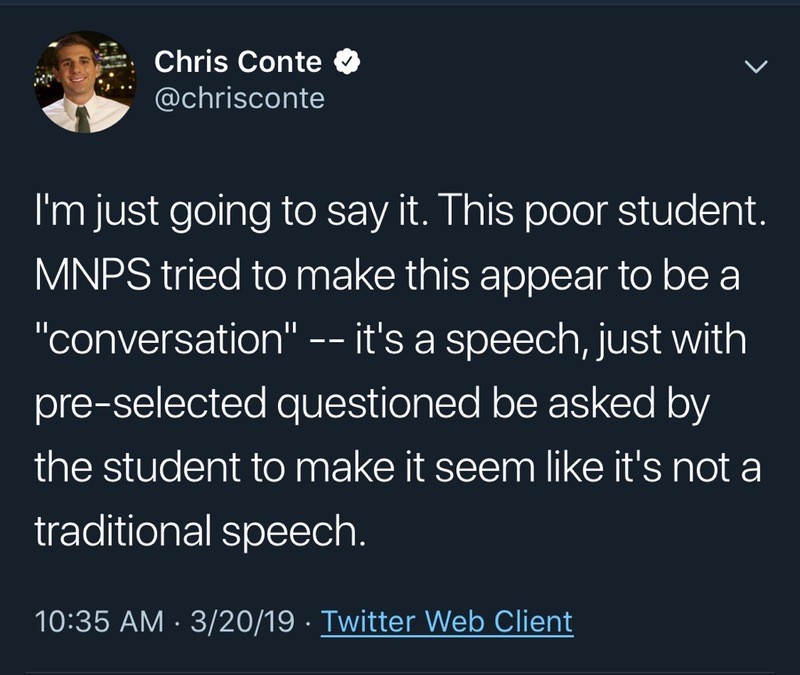 Joseph for his part delivered his normal elevator speech – MAP scores up, more kids advanced placement classes, more money to the classroom – in a speech that fails to hold up under close examination. It felt to me like Musgrave’s participation was enlisted to give Joseph cover from critics. The thought being, that with a student as a major participant, it would be harder for critics to raise concerns. Joseph repeatedly marveled at Musgrave creation of the student support group. While not downplaying the magnitude of the accomplishment, I do have to ask, is this not a need that someone with a degree in education could instantly identify and in turn implement system wide? Why was the district not actively facilitating support groups for kids in all schools, without having the need pointed out by a student? Without getting too in the weeds about the director’s speech, I do want to point out that at one point he made the comment that, we all recognize that all children are gifted, and just need an adult to pull that gifted-ness out of them. That is not a true statement and in the current environment, locally and on a state level, should raise some concerns. There seems to be an increased mingling of really smart kids – high performers – and gifted kids and the two are extremely different. Gifted kids are not always high performing and require very specialized services. Any lumping of the two together needs to be pushed back on as it under serves students. I am sure that Dr. Joseph knows the difference, but I suspect that at times the relentless pursuit of “equity” clouds perception. As he said at the State of Schools, we have an agenda of equity. I would argue that the agenda could use a little more excellence interjected into it. On Thursday night, the local chapter of the NAACP and some local ministers held a rally for Dr. Joseph. As a rally was held last year as well, it seems this is on the cusp of becoming an annual event. I remain puzzled about why the focus on one man versus the entire system. It’s the budget season and the current proposed budget does not contain funding for adequate raises for employees or critical supports for a new discipline policy, nor does it contain any indication of next year producing different results than this year. A year that saw the district fall short on academic growth and the director receiving an average score of a 2 on a yet to be completed annual review. The last few months have also produced a district paid audit that showed a highly dysfunctional HR department. Further complicating matters, is a pending review by the state board of education about Joseph’s adherence to state policy. Word on the street is that the review committee is submitting a recommendation to the state board that Joseph’s license is suspended for a year. If that word, proves factual, that’s pretty substantial. Thursday night also brought another Channel 5 News story, this one featuring an African-American minister who is assessing where she is laying her support. “You’re rallying to save his job,” Fuzz told NewsChannel 5 Investigates, referring to the upcoming rally by his fellow ministers. My response would also be to ask when have 100 people – the approximate number in attendance – been considered the “white community”? Until we recognize the diversity, both in breadth and depth, in every community we are doing its members a disservice. Those are pretty implicit demands and ones that are beyond the pay grade of MNPS employees. Gabella-Singer and North purportedly work for the district, not the director. Their appearance at the rally gives an air of endorsement for the speakers’ demands. They are certainly welcome to attend as private citizens, but to speak without clarification of position and role is inappropriate. That’s going to have to do it for right now. On Monday I’ll get into what happened at the board retreat and the juvenile antics of board member Will Pinkston. I think it’s important to take the weekend to reflect before sharing my thoughts. Thank you for your support. Make sure you check out the Dad Gone Wild Facebook page where we try to accentuate the positive. If you’ve got something you’d like me to highlight, send it on and I’ll do the best I can. Send things to Norinrad10@yahoo.com. Thanks for your support if you feel so inclined, please head over to Patreon and help a brother out. Make sure you answer the poll questions and we’ll see you Monday.